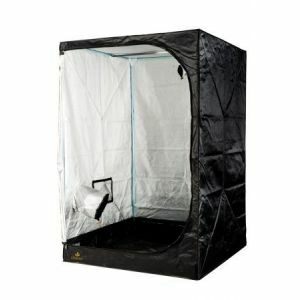 The DR120 Dark Room 2.5 from Secret Jardin is the most popular sized tent we sell (120cm x 120cm x 200cm). This is because the DR120 isa perfect space for a 600w lighting system which is watt to watt the most efficient hydroponic light available. The DR120 would require a 125mm/5inch or 150mm/6inch extraction system. The DR120 dark room 2.5 has 4 adjustable holes for extraction or air cooled lighting and 2 for cables. 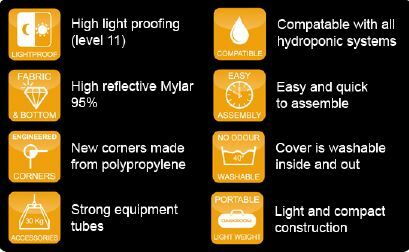 All of the grow tents in the Dark Room range feature sturdy contruction, highly reflective, waterproof mylar covers and excellent construction quality.This tent is the brand new,improved Secret Jardin dark room 2.5 range which features sturdier corner pieces and benefits from an improved multi layer mylar coated covering. Do Not Mistake these with the street version they are a far better quality!!! Please make sure you have measured your space properly before ordering your tent. We will only except returns if the product is in its original packaging with all contents in the same condition it was sold. The customer will be liable for any return shipping costs and may be charged a restocking fee. RVK Fan & Rhino Pro Filter kit 6"